1976 was a real wild year in Berlin. David Bowie, Iggy Pop, Brian Eno among many others came into town to live here for a while and rehearse tour stuff or prepare themselves for studio recordings. ‘Hansa’ by the Wall was the place to meet for sessions or just looking over some friends shoulders to see which instruments they are juggling around with. It has been much more a kind of music philosophical melting pot at that time other than being a hype stardom affair. 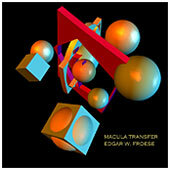 Macula Transfer is reflecting this ‘structured anarcho´ music scene as Edgar named it during an interview. It did take him just three weeks to make the first time recording. Re-recordings and tasteful layers now 29 years later have given this music a new dress by keeping the timeless atmosphere of the music. Titles named after flight numbers of some of Edgar’s trips in 1976.